I still haven’t discovered anything worth putting on a good banana bread. Butter, peanut butter, Nutella–all of these fail to improve upon that which is perfect. Although I have found that Banana Bread is a good bread for French Toast, even if it is a quick bread without all that fancy yeast. I’ve seen others do this online, but when I mentioned it to people in real life they thought I was just weird. So be it. 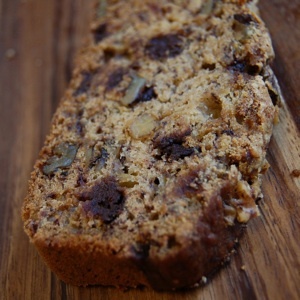 I like my banana bread with tons of walnuts and chocolate chips. Some people prefer it with none of these extra ingredients. These people are crazy, but that’s okay, because these people don’t get any walnuts and chocolate chips. In the ingredients here I’ll go with 1/2 cup each of walnuts and chocolate chips for the bread. I like to use more (and in the pictures here, certainly, there are more), but I’ll stick to what most people I think would enjoy. It’s also what was on the original recipe I had, at some point. But I forget where it is from, and I forget what I modified. 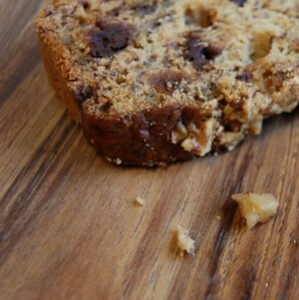 However, this banana bread recipe is moist, delicious, and awesome. And it can pretty easily be doubled or tripled. I’ll also note that every banana bread recipe I read always says, “the riper the bananas, the better.” I guess it releases sugars or some such thing. Anyways, I don’t ever plan ahead enough to have three ripe bananas, so I buy bananas as ripe as I can find them, and then leave them in a bag for a few hours, which helps a bit. People also freeze them, but then they’re hard to mash up, so I generally don’t do that. 1. Butter/grease/spray with Pam a 9″ loaf pan. I also like to add a long strip of parchment paper across the center and long sides of the pan so that you can lift the entire loaf using the paper when it’s done. 2. Mash up the bananas. Beat in with butter, sugars, egg, and vanilla. 3. Mix flour, baking soda, cinnamon, and salt; add this to the wet mixture. Throw in the chocolate chips and walnuts. 4. Pour mixture into loaf pan. Bake at 350 degrees for 50-60 minutes, until a toothpick inserted into the centre of the banana bread comes out clean.